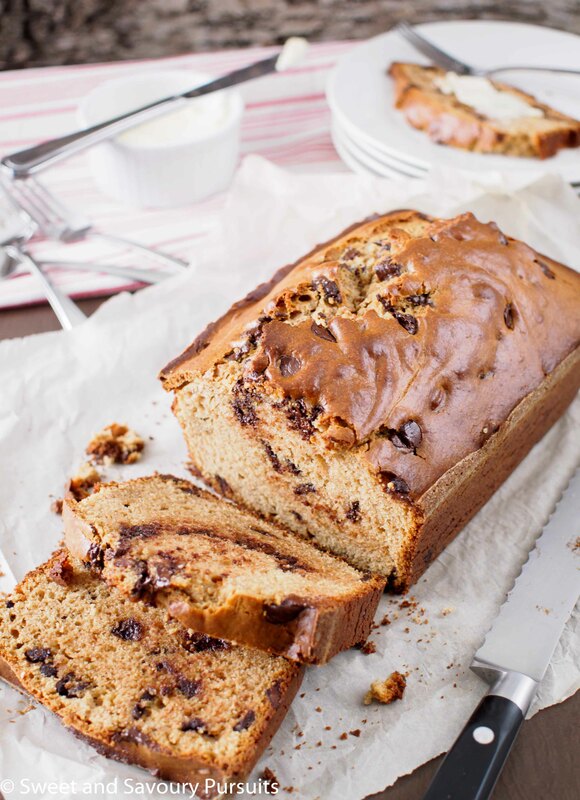 Try slices of this delicious Peanut Butter and Chocolate Chip Loaf plain, toasted with butter and honey, jelly or for a more decadent treat, Nutella. I’ve been looking for some delicious new ways to incorporate peanut butter into my baked goods. After doing some research on the internet, I found this recipe for bread that uses a whole cup of peanut butter. Finally, I thought, there should be some real peanut butter flavour in this. The recipe I found was on the blog She Wears Many Hats. What I found interesting about her recipe is that she mixes her ingredients in the blender. Though the idea intrigued me, I’m afraid my blender quit on me and I haven’t gotten around to replacing it. So I decided that I would make this bread using my mixer. The recipe was so simple and I didn’t want to change that, so all I did in my version was to use some whole wheat flour, replaced the granulated sugar with brown sugar and added some chocolate chips to make the kiddies happy. 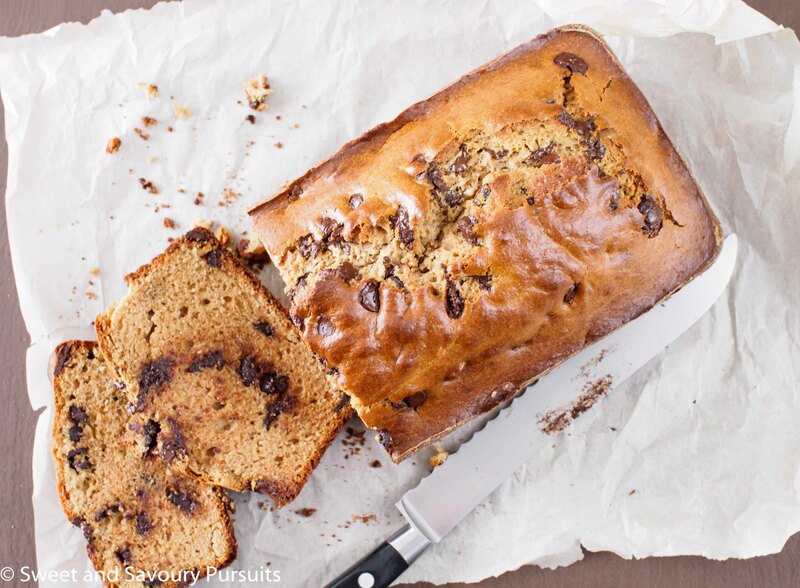 This Peanut Butter and Chocolate Chip Loaf was delicious and so quick and easy to make. There are so many ways to eat this bread: plain, toasted with butter and honey, jelly or even Nutella (my favourite way so far). It makes a great snack for kids with a glass of milk. In case you want to make this recipe in the blender, here is the link to the original recipe. Grease and flour one 9x5x3- inch loaf pan. In a medium bowl, whisk together the flours, baking powder, and salt. Set aside. In another bowl, beat the sugar and peanut butter until well combined. Add the eggs, one at a time, beating until incorporated. Mixing on low speed, add half the flour mixture, then half the milk, mix until blended and then repeat by adding the rest of the flour and milk. Mix until all the flour is incorporated, scrape the bowl and then continue mixing until batter is smooth. Pour the batter into the greased loaf pan. Bake until the loaf is golden brown and a toothpick inserted into the loaves comes out clean, about 50 to 55 minutes. Cool in the pan on a rack for 15 minutes and then turn the loaf out unto a wire rack to cool. I’m not a big peanut fan, but this looks so savory I can’t wait to try it! You can never go wrong with peanut butter and chocolate.. I love the sweet/salty combination. This bread looks divine! This is such a beautiful, delicious-looking loaf! I have started getting into baking bread and I’m a big fan of peanut butter. This goes in the must try lot, that’s for sure!!! That’s great, let me how you like it if you end up trying it. I love PB and chocolate any way I can get it 🙂 This looks delicious! I love the addition of the brown sugar to this. I think this would be so good with a bowl of chili! Hi Julie, it never occurred to me to have this with chili, but that might work cause the bread is not very sweet. I love having sweet breads and muffins with savory soups! Or… maybe I just can it them any where any time too! This loaf looks great and easy to make!!! This loaf looks amazing, love the recipe! Fabulous looking bread!! I love PB & chocolate anything and this looks absolutely delicious!